In April 2004, Hiraku Yamamoto(Violin), Kanade Kageyama (Guitar), Yu Kawakami (drums/djembe) formed Nabowa. In March 2006, Itaru Horikawa (bass) joined the band. They started to perform at the street in Kyoto featuring improvisation of various music genre like dub, jazz, rock, ambient and modern music. Their performances and heartwarming melodies got good reactions from all ages people and received live offers from various places like clubs, live venues, cafe, bars, department store, temple, wedding place, etc. 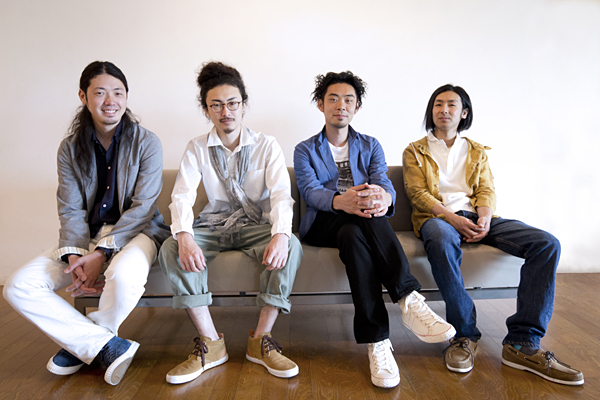 They released their debut single “Pole Pole / Continental Landscape” in 2007, the limited mini album “River” and the first album “flow” in 2008, the mini album “view” and the remix album “Re-flow” in 2009. In 2010, a long waited second album “Nabowa” was released and it has become a big hit. They had performed with internationally recognized artists like The Baker Brothers, Tommy Guerrero, Mattson 2…etc and performed in some big festivals in Japan like FUJI ROCK FESTIVAL (2010, 2011) . In 2011, they released new single “SUN” in spring, and the new album “DUO” featuring guest vocalists will be released in autum..